Directions (Q. Nos. 1-10) Select the correct alternative from the given choices. 1. The values of the numbers 22004 and 52004 are written one after another. How many digits are there in all? 2. Rajat draws a 10 x 10 grid on the ground such that there are 100 identical squares numbered 1 to 100. If he has to place two identical stones on any two separate squares in the grid, how many distinct ways are possible? 3. Mohan is a carpenter who specializes in making chairs. For every assignment he undertakes, he charges his commission and cost. His commission is fixed and equals ₹ 560 per assignment while the cost equals ₹ 2n2 where, n is the total number of chairs he makes. If for a certain assignment the average cost per chair is not more than ₹ 68, then the minimum and maximum possible numbers of chairs in the assignment are, respectively. 4. Let f n+1(x) = fn (x) +1 if n is a multiple of 3 = fn(x) – 1 otherwise. If f1(1) = 0, then what is f50 (1)? 5. On a plate in the shape of an equilateral triangle ABC with area 16√3 sq cm, a rod GD, of height 8 cm, is fixed vertically at the center of the triangle. G is a point on the plate. If the areas of the triangles AGD and BGD are both equal to 4√19 sq cm, find the area of the triangle CGD (in sq cm). 6. Vaibhav wrote a certain number of positive prime numbers on a piece of paper. Vikram wrote down the product of all the possible triplets among those numbers. For every pair of numbers written by Vikram, Vishal wrote down the corresponding GCD. If 90 of the numbers written by Vishal were prime, how many numbers did Vaibhav write? 7. Two cars A and B start from two points P and Q respectively towards each other simultaneously. After travelling some distance, at a point R, car A develops engine trouble. It continues to travel at 2/3rd of its usual speed to meet car B at a point S where PR = QS. If the engine trouble had occurred after car A had travelled double the distance it would have met car B at a point T where ST = SQ/9. Find the ratio of speeds of A and B. 8. There are two water drums in my house whose volumes are in the ratio 1 : 5. Every day the smaller drum is filled first and then the same pipe is used to fill the bigger drum. Normally by the time I return from my college, i. e., at 1 : 30 pm, the smaller drum would just be full. But today I returned a little early and started drawing water from the well with the help of a bucket, poured one-third into the smaller drum and the remaining into the bigger drum. I continued this till the smaller drum was filled. Immediately after that, I shifted the pipe into the bigger drum and went for lunch. Today if the bigger drum was filled in 12 min before its normal time, when was the smaller drum full? 9. Let Sn denote the sum of the squares of the first n odd natural numbers. If S„ = 533n, find the value of n.
10. In the figure alongside, AABC is equilateral with area S. M in the mid-point of BC and P is a point on AM extended such that MP = BM. 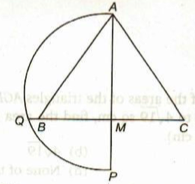 If the semi-circle on AP intersects CB extended at Q and the area of a square with MQ as a side is T, which of the following is true? Directions (Q. Nos. 11-12) These questions are based on the following data. One morning, Govind Lai the owner of the local petrol bunk, was adulterating the petrol with kerosene. He had two identical tanks-the first was full of pure petrol while the second was empty. First he transferred an arbitrary amount of petrol from the first tank into the second and then replaced the petrol removed from the first tank with kerosene. He then repeated this process one more time but this time he ensured that by the end of the process the second tank was exactly full. 11. Which of the following can be the concentration of petrol in the second tank? 12. If the concentration of petrol in the second tank is 75% and the cost price of kerosene is half that of petrol, then what is Govind Lai’s net profit percentage on selling the contents of the second tank given that he claims to sell the petrol at a profit of 25%? Directions (Q. Nos. 13-17) Select the correct alternative firm the given choices. 13. Auto fare in Bombay is ₹ 2.40 for the first 1 km, ₹ 2.00 per km for the next 4 km and 1.20 for each additional km thereafter Find the fare in rupees for k km (k≥ 5). 15. Rekha drew a circle of radius 2 cm on a graph paper of grid 1 cm x 1 cm. She then calculated the area of the circle by adding up only the number of full unit-squares that fell within the perimeter of the circle. If the value that Rekha obtained was d sq cm. less than the correct value, then find the maximum possible value of d? 16. In the above question what is the minimum possible a value of d? 17. The graphs given represent two functions f(x) and g (x) respectively. Which of the following is true? Directions (Q. Nos. 18-19) These questions are based on the following data. A is standing 5 m East and 4 m North of a point P while B is standing 15 m East and 24 m North of P. A walks at a speed of 1.4 m/s while B walks at a speed of 2.1 m/s. 18. If A and B simultaneously start walking towards each other and finally meet at a point Q, then find the distance PQ. 19. If A and B simultaneously start walking East and South respectively, then which of the following is true of the distance of closest approach ‘d1’ between them? 20. What is the area of the triangle bounded by the graph of the given function with the coordinate axis given by x = 0 and y = 0? 21. Which of the following is not true about the graph of f(x)? (a) A portion of the graph is parallel to the line y = 25. (b) A portion of graph is in 2nd quadrant. (c) Some portion of graph lies in 1st quadrant. (d) Some portion of graph lies in 3rd quadrant. Directions (Q. Nos. 22-24) Study the following table and answer the questions that follow. 22. In which year did the average disbursement of loans record the highest percentage increase over that of the previous year? 23. In which year and for which bank was the percentage contribution to the total value of loans disbursed for that year the lowest? 24. For a certain scheme, the qualification is that a bank should have consistently achieved a minimum of 20% of the total disbursement of all banks for each of the last four years. Which of the banks qualify as on the year 1986? Directions (Q. Nos. 25-27) Answer these questions on the basis of the information given below. 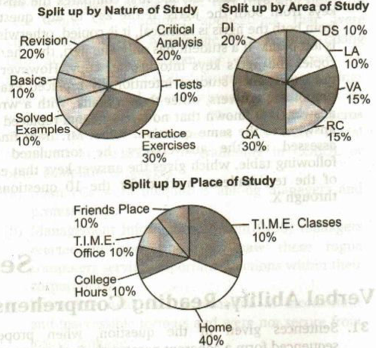 Each of the following pie charts gives the percentage split up of the total time spent by a certain student towards preparation of CAT 2005. 25. If atleast 5% of the time spent on each area of study was spent on solved examples of that area, then the time spent on solved examples in any area of study, as percentage of the total time spent on that area of study, is at most. 27. At the most what percentage of total time was spent on test taken in VA and LA? Directions (Q. Nos. 28-30) Answer these questions on the basis of the information given below. When Munna Bhai joined the university of South Ghatkopar for his M.S., Mr. Irani, his professor, asked him to prove his calibre in a test conducted for the entire class. The class comprised of exactly 10 students. The test contain exactly 10 multiple choice type questions. However, Munna as is always the case, managed to get the correct answer-key for all the 10 questions well before the exam. But in the exam, he wrongly marked exactly one question, on purpose, to avoid raising any suspicion. All the other nine students of the class also formed their respective answer-keys in the following manner. They first obtain the answer-key from one or two of the students, who are called his/her jigris, who already have their answer keys. If a student has two jigris, then he/she first compares the answer keys from both the jigris. If the key to any question from both the jigris is identical, it is copied, otherwise it is left blank. If a student has only one jigri, then he/she copies the jigri’s keys into his/her copy. However, in the exam, each student intentionally replaced exactly one of the answers, other than a blank, with a wrong answer. It is known that no two students replaced the answers to the same question. 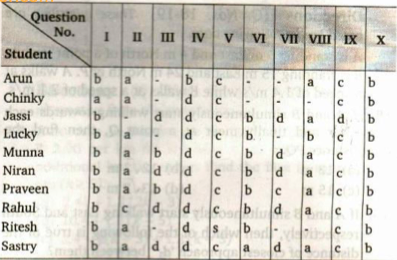 When Mr. Irani finally assessed all the answer-keys, he formulated the following table, which gives the answer-keys that each of the ten students marked for the 10 questions- I through X. 29. Who among the following is not the jigri of any of the ten students? 30. Who are the jigris of Gunky? 31. Sentences given in the question, when properly sequenced form a coherent paragraph. Each sentence is labeled with a letter. Choose the most logical order of sentences from among the four given choices to construct a coherent paragraph. (A) Paucity of serious thought is no surprise in the government, but one would have thought that the considerably educated PM, who at one time did research of some quality, would have tried to answer for his own satisfaction how effective reservation policies have been. (B) In his approach to Pakistan, he has gone about enthusiastically looking for out of the box solutions. (C) Assuming that he came to the above conclusion-it is hard to imagine how he would come to any other? (D) My question is why should they be confined to the Pak policy only? SC/STs deserve them more. 32. Sentences given in the question, when properly sequenced form a coherent paragraph. Each sentence is labeled with a letter. Choose the most logical order of sentences from among the four given choices to construct a coherent paragraph. (A) Overcoming the handicap of crushing poverty, he has had a phenomena, run thus far. (B) Soon enough, the mentor find exploitation charges, with a government agency taking objection to the manner on which the boy’s grooming is being handled. (C) When his widowed anther was reportedly on the verge of giving up on it all, a martial arts coach descended on stage like a deux ex machine. 33. In the gives question, all the sentences except one sentence, where properly sequenced form a coherent paragraph. Each sentence is labeled with a letter. Choose the sentence which does not form a part of the paragraph from among the four given choices. (A) The revolution, called Human Relations is quieter but more profound and is sweeping through U.S. industry. (B) Gradually, men felt themselves swallowed by a vast, impersonal machine, which rubbed away their self-respect and in a way their identities. (C) In anger against betrayal of the human spirit by the Industrial Revolution, millions of workers listened to the false promises of Marx’s philosophy. (D) The Industrial Revolution, replaced the tools of the independent workmen with machines, had transformed handicraftsmen who were their own bosses into hired hands subject to the orders of managers. 34. Each question consists of sentences, which have one or two blanks, each blank indicating that something has been omitted. Below each sentence are four numbered words or sets of words labelled (A) through (D). Choose the set of words that, when inserted in the sentence, best fits the meaning of the sentence as a whole. A …………. statement is an …………. comparison; it does not compare things explicitly, but suggests, a likeness between them. 35. The question given below consists of a sentence which is divided into four parts, numbered (A) through (D). Only one part in the sentence is not acceptable in standard written English. Identify that part in the sentences which contains the error. 36. In the following question, four different sentences are given. Choose the option that contains the grammatically incorrect sentence/s. I. He is feeling that this relocation is nothing but the kick upstairs. II. Consensus is now emerging at our state and national levels. III.A more and more rigorous circle is formed from which one is more and more unlikely to escape. IV.It happened up on a system that worked. 37. Given below are sentences, each using the question word different ways. Identify the sentence which uses the question word in a grammatically incorrect manner. 38. Given below are sentences, each using the question word different ways. Identify the sentence which uses the question word in a grammatically incorrect manner. 39. Given below is a paragraph whose last line is missing. Choose the line which completes the paragraph most logically from the options given below. The real change in corporate culture began with the personal computer. With the PC, any empolyee could have a computer of his or her very own and use if for real work. It simplified applications that were cumbersome with a mainframe even without taking into account the problem of gaining access. A mainframe required a skilled programmer to do things that a non-technical user eventually could easily do with a spreadsheet on a PC. The forms and macros required to solve problems on PCs were trivial compared to traditional programming in COBOL or other computer languages. (a) Soon PCs were ubiquitous among managers and professionals. (b) Management Information System (MIS) managers reacted in horror as they saw these rogue computers serving important functions within their corporations. (c) These PCs held vital information in inconsistent and inaccessible formats and were not secure from loss or damage. (d) Eventually, MIS departments connected PCs to their corporate mainframes, but primarily as replacements for dumb terminals. Some users, however, were more creative. 40. Given below is a paragraph whose last line is missing. Choose the line which completes the paragraph most logically from the options given below. So the unpleasant shocks that used to affect other people now affect us. Few of us have not been touched on the shoulder lightly or, in some cases, heavily, by the hand of failure. A dozen or more years ago, failure was for the untalented, or the unlucky. Today, no one is safe. (a) It is a strange irony that while changes in fortune are now more personal, other changes have become less so. (b) This, ofcourse, applies to services as well as products. (c) Constantly improving products and services is an intrinsic part of staying in business. (d) Another is the fact that there are more scientists alive today than ever lived in the history of the world. 41. Given below is a paragraph whose last line is missing. Choose the line which completes the paragraph most logically from the options given below. The remake the world (including Nature), Fourier mobilised : an intolerance (for civilisation), a form (classification), a standard (pleasure), an imagination (the ‘scene’), a discourse (his book), all of which pretty well define the action of the signifier or the signifier in action. This action continually makes visible on the page a glaring lack, that of science and politics, that is, of the signified. (a) What Fourier lacks points is return to what we ourselves lack when we reject Fourier : to be ironic about Fourier is always even from the scientific point of view to censure the signifier. (b) However, the relationship of Desire and Need is not complementary were they fitted one into the other, everything would be perfect, but supplementary; each is the excess of the other. (c) The excess : what does not pass through. (d) The vomiting of politics is what Fourier calls Invention. Directions (Q. Nos. 42-50) Read the paragraphs given below and answer the questions that follows. The Nostradamus fad might have been just that, a short-lived blip that would evaporate when the next big thing came along. And it might have been dismissed as nothing more than a few whackos’ nutty obsession with doomsday. But a lot of un-nutty Japanese take it seriously and it’s influence has persisted for nearly three decades. The most alarming development occurred when certain cults including Shoko Asaharas Aum got in the act. Aum which allegedly masterminded the deadly sarin gas attacks to attract followers already bitten by the Nostradamus bug. Other groups did likewise while also providing avenues for surviving doomsday. Writers like Goto fanned a sense of fear. The books sells but they do not have any answer and the cult steps in and generates followers in mere sensationalism. These days Nostradamus has become such an ingrained part of Japanese pop culture that most people are well versed with his doomsday scenario. Even many skeptics pause to consider his predictions when confronted with the real world dangers. Ever since Pyongyang sent a missile flying over Japan last August, North Korea has been considered as the most plausible source of apocalyptic of the yen, Martina Hingis loss at Wimbledon would suffice among the faithful as evidences that Nostradamus was on to something. This fever in Japan tends to skew towards young people like 18 year old Inoue, who wanted to feel as if she had achieved something before the world ends. The goal she decided would be to create fashion. She promoted beach clothes, cosmetics and drugs that would enhance a woman’s bust. Here it is not sure whether she was using Nostradamus to promote a career in marketing. And she is a perfect example of how fact and fantasy can coexist in today’s Japan. Nishimoto on other hand has made full preparations and needs no convincing. He has outfitted his home in Habikino, a suburb of Osaka with a personal bomb shelter. It has 30 cm thick concrete walls reinforced with steel escape hathes, a hand cranked battery operated generator and a ventilation system that pumps in air while filtering out radioactive elements and biological and chemical contaminants. 42. What is the author’s view on Japan? 43. “Here it is sure whether she was using Nostradamus to promote career in marketing.” What is the underlying tone in this line? 44. Which of the following can be implied from the passage? (a) Nostradamus’ prophecies have been influencing the people of Japan for the past thirty years. (b) Nostradamus’ prophecies have been the inspiration for various pop songs in Japanese. (c) Nostradamus’ predicted about Korean missile, Hingis would lose, weakness of the yen and the European chicken. 45. What according to the passage is probably the most deadly effect of the Nostradamus fad? I. Silliness of the Japanese people. II. The series gas attack. III. The cult culture that demands blind following. IV. Sensationalism that generates followers. “Let me, “ cried Shakespeare’s Julius Caesar, “have men about me that are fat, sleek-headed men and such asleep o’ nights.” One can see his point. There is something infinitely measuring about a rounded, even cherubic, circumstances, something sound and trustworthy about a man of bulk. Now this may, of course, be merely an optical illusion. But the lean and hungry look does not, in general, inspire confidence. Perhaps that’s why, when a fat man is proved to be a villain, he’s very villainous indeed. We feel sadly let down. Ramblings such as this occurred to me in considering the case of the television presenter. In recent weeks the nature of my work has brought me face to face with many forms of the genus interlocutor. As you know, they come in many shapes and sizes. Any consideration of their merits must begin with the visual impression that they make. Let us disregard the disembodied ones, the out-of-vision narrators, those known in the trade as “voice-overs”. Our business is with the front men and women in corporeal view, upon the producer pins all his hopes of an audience joining and staying with his product. And, while it’s a television truism that the strengths of a chat show or a magazine is often the stength of its weakest link, it’s equally true that a presenter can make or mar the best-intentioned programme. It is no easy task. Far too often presenters and producers forget that the Box is essentially an intimate medium. It is not a market place, nor a Speaker’s Comer. And as in those two public arenas the louder the voice the more strident the appeal, the more dubious appear the goods for sale. No, your good presenter must get on intimate terms with his viewer-singular, not plural. He may in numerical terms be talking to millions but it is still a one-to-one business. So, the essence of the craft is the quiet, conversational buttonholing of the viewer. This is precisely the point at which good TV Presentation Parts company with show business. Introducing the next item or personality in a steady crescendo of spurious excitement is no more than rabble rousing, to elicit audience applause. Often what follows falls flat on its face, despite the bolstering of audience reaction, for the viewer at home is solitary, before his set. The ground rules of presentation are pretty obvious-a friendly face and manner, a persona one can like on first impression or warm to as the one-way conversation continues. It was no accident that the archetypal presenter, Richard Dimbleby, was so good at his job. He was a large man, voice and personality projected effortlessly into the home.Always the keynote was a quiet sincerity. In a lighter fashion, the ever-green Cliff Michelmore continues the tradition. He’s another rounded person, in several senses, with whom the viewer finds instant rapport. Of course, there are dangers in the large personality. It can be allowed to grow so that it fills the screen, allowing only a peep over the shoulder of the famous front man at what the programme’s really about. 46. What is the “optical illusion” referred to in the passage? 47. How can an interlocutor be ‘disembodied’? (a) Because the telecasts are poor. (b) Because the frames are edited haphazard. (c) Because the viewer never sees them physically. 48. What are the two public arenas referred to by writer? Last November, I organized a seminar about terrorism in aviation. In order to drive home the potential hazards to the students, we visited a large eastern U.S airport with the intention of acting like a terrorist group looking for targets of opportunity. What we discovered was, at times fascinating and at other frightening. In general US airports have two areas where the visitors have access : a public area with little active security measures and a more secure area in the airport waiting and boarding areas. The less secure areas usually contain ticket counters, baggage claim, gift shops, restaurants and other airport services. Getting into the main areas involves going through a screening process that includes X-ray inspection of carry-on items and walking through metal detectors. Other security measures include limiting curbside parking at the terminal, securing unattended luggage and requiring that all passengers be identified by the airlines by use of a picture identification. In the academic exercise, the group made several notable security observations. Most of the trash bins in the terminal areas were set within larger concrete containers. An explosive set within one of these containers would likely be directed upward. However, in several cases there were metal and fiberglass containers, sometimes adjacent to the concrete ones; also located around the terminal. During visit, there were numerous announcements about how unattended baggage would be collected by the airport authority. At one point, our party observed an unattended umbrella propped against a wall near one of the screening areas. The umbrella was plain in view and in close proximity to constant foot traffic. It was over 45 minutes before an airport staff member removed the umbrella. Most areas of the terminal were designed such that it was difficult to leave a bag unattended in heavily travelled areas of the terminal without it being seen. Our group specifically observed custodial staff going about their duties to see they were security conscious. In general, we were quite impressed with the level of security. The most worrisome aspects of what we saw were that the effectiveness of active and passive security measures varied greatly, and that a group of people unschooled in the ways of terrorism could very quickly discover numerous opportunities for committing mayhem without being detected. 49. Which statement is correct? (a) Ticket countries are more secure than boarding areas. (b) Boarding areas are as secure as ticket counters. (c) Boarding areas arc less secure than ticket counters. (d) Boarding areas are more secure than ticket counters. 50. Which statement/s is/are incorrect? I. US airports have two insecure areas where the visitors have access. II. The effectiveness of active and passive security measures varied greatly. III. The US airport authorities were quick in collecting the unattended baggage. 51. Given a and b = a – b; a and b but c = a + c -b; a or b = b – a; a but not b = a + b; find 1 or (2 but not (3 or (4 and 5 but (6 but not (7 and (8 or 9)))))). Directions (Q. Nos. 52-55) These questions are based on the following data. x@y : gives the positive difference of x and y.
x $y : gives the sum of the squares of x and y.
x £ y : gives the positive difference of the squares of x and y.
x& y : gives the product of x and y. Also, x,y ϵ R and x ≠ y. The other standard algebraic operations are unchanged. 52. Given that x @ y = x – y, then find (x $y) + (x £y). On the eve of a special function in view of ‘National Integration’, seven participants – A, B, C, D, E, F and G, are to be accommodated in two rooms, each room having a capacity of four persons only. For the allocation, the following conditions must be considered. (i) A, a Gujarati, also speak Tamil and Bengali. (ii) B and F are both Bengali and speak only that language. (iii) C, a Gujarati, also speaks Tamil. (iv) D and G are Tamilians and speak only Tamil. (v) E, a Gujarati, also speaks Bengali. (vi) Bengalis and Tamilians refuse to share their rooms with each other. Further, it is necessary for each participant in a room to be able to converse with at least one other participant in the same room, in at least one language. 54. Which of the following combinations of participants in a room will satisfy all conditions for both the rooms? 55. What is the total number of various combinations of room-mates possible, which satisfy all the conditions mentioned? Directions (Q Nos. 57-58) These questions are based on the data given below. Three trains- Rajdhani Express, Shatabdi Express and Taj Mahal Express- travel between two stations without stopping anywhere in between. No two trains have the same starting station or the same terminating station or the same travel fare. Also, th following known about these trains. (iii)Fare for the trains which travel between Bengaluru and Agra is ₹750 less than the fare for Taj Mahal Express. (iv) The fare for Rajdhani Express is ₹150 less than the fare for Taj Mahal Express. 57. What the fare for Shatabadi Express? 58. Which among the following statements is definitely true? (a) The fare for Shatabdi Express which, travels between Bengaluru and Agra is ₹ 1800. (c) The fare for Rajdhani Express, which travels between Chennai and Pune is ₹ 1650. Directions (Q. Nos. 59-60) These questions are based on the data given below. In a recently held test series consisting of three matches-I, II and III, five players-Sehwag, Ganguly Tendulkar, Dravid and Laxman, are the top five scoring batsmen, not necessarily in the same order. (i) No two players scored the same number of runs in any match. (ii) Sehwag scored more runs than Ganguly in the 1st and 2nd matches. (iii) The player who scored the highest runs in the 3rd match scored the least runs in the 1st match. (iv) Dravid scored more runs than Laxman but less runs than Tendulkar in the 2nd match. Tendulkar scored more runs than Laxman in the 1st match. Laxman scored more runs than Ganguly but less than Dravid in the 3rd match. (v) Tendulkar scored the lowest runs in one match and in two matches his position in the decreasing order of the runs scored by the batsmen is same. He was not the top scorer in any of the three matches. 59. Among the given five players, who scored the least number of runs in the 3rd match? 60. If Tendulkar scored more runs than Ganguly in the 2nd match, then who is the second highest scorer in the 1st match?